It's just another Thursday morning in July of 1953 when the doorbell rings at 137 Hartford Street and it's bad news. Carter's father has been murdered in Georgia and the local sheriff has no intention of finding out who really did it. So, Nick and Carter borrow the first plane that Marnie, Nick's amazing secretary, can find for them and they zoom off back into the past to see if they can uncover the truth of what really happened before the wrong man is convicted. And, knowing the lay of the land under the moss-covered oaks, Carter is pretty sure that the color of a man's skin will figure heavily in who takes the fall. 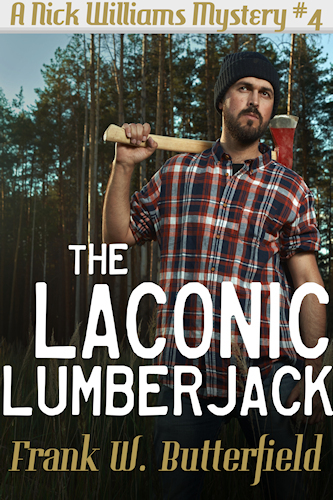 In The Laconic Lumberjack, the best Nick can do is stand by Carter's side as he confronts an awful past, uncovers some surprising secrets, and deals with the unsavory reality of small-town hypocrisy.